Completed in late 2015, Montana is a 4 Residence multi-residential project in Mountain Grove, Kew. 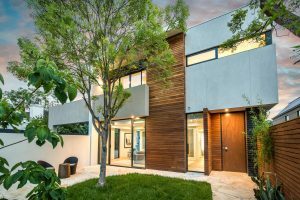 In 2016 the Montana made a clean sweep, taking out the 2016 Boroondara Urban Design Award for Best Small Scale Multi-Residential Project, the 2016 Master Builders Award for Best Multi-Residential Development (4-12 Units), the 2016 HIA Awards for Townhouse/Villa Development of the Year and the Best Townhouse over $700,001 per dwelling. In fact Montana has won every award it was entered for, which is an extraordinary achievement for a boutique residential builder. As you can imagine, Montana is a true testament to the meticulous detail and superb finishes of all Virgon homes. Virgon and our clients are incredibly proud and excited about the success of this innovative, modern design. Each residence at Montana is comprised of four bedroom and bathroom masterpieces that stretches over three, lift-accessed levels. The impressive features includeAmerican Oak floorboards, bespoke metal and timber features, and a Mondolucci designed stairwell pendant. The residences embrace light-filled bathrooms with Italian made fittings. The kitchen features Calcutta marble finishes while a gas pebble fireplace and feature wall grace the spacious living and dining areas. Spacious bedrooms and a maturing landscaped garden oasis complete the award-winning multi-residential building. Our carefully considered design and knowledge of the local area was met with praise from the City of Boroondara for the way it positively complemented the affluent surroundings area of the Sackville Ward. With over two decades of experience building in the Boroondara market, Virgon has firmly earned our reputation as the Boroondara Specialists! As award winners we are incredibly excited and proud to now be representing Victoria at the 2017 HIA Awards. We pride ourselves, as boutique home builders, on our ability to not only reach our clients’ expectations, but exceed them. The recognition Virgon and the Montana have received from our top industry awards only pushes us to strive for bigger and better things in the future. We are ecstatic for this opportunity to not only represent Virgon, but also Victoria at the prestigious HIA awards. Please check back in next week to find out the results! Interested in your own Virgon boutique home? Please contact us today on 03 9819 9109 or via our Contact Page.